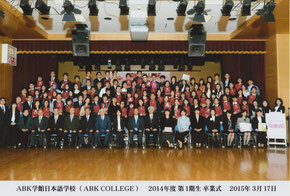 The first graduation ceremony of ABK COLLEGE was held on March 17th, 2015. Congratulation on your graduation! We wish for your continued success in the new environment. Please come visit ABK COLLEGE anytime you have a chance.